The New Ten Commandments Cinema Trailer from Lansdowne Productions on Vimeo. There is no such thing as a “pure” culture. The horrors perpetrated during the Second World War in the name of such a mistaken belief led largely to the Universal Declaration of Human Rights in 1948. The United Nations adopted this document in an attempt to make human rights a reality for everyone. Every single person has rights and each one of us has the duty to stand up, not just for our own rights, but also for those of others. 60 years on, Scotland now has its own Parliament and a multi-cultural population that can trace its ancestors not only to refugees from the Second World War and the subsequent decolonisation of the now-defunct British Empire, but also to more recent political and geographical upheavals. The result is a vibrant, integrated and occasionally challenging culture within which stories of human rights abuses sit alongside tales of human rights recognition. 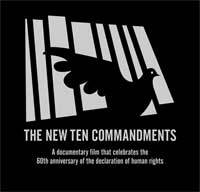 To celebrate the 60th anniversary of the Universal Declaration of Human Rights, Scotland’s most talented filmmakers and visual artists have collectively created The New Ten Commandments. United by a single theme – Human Rights in Scotland – these films communicate a variety of artistic visions whilst exploring the real life stories of those for whom the Universal Declaration has intimate meaning. With a rights culture that tackles issues surrounding torture, slavery, liberty, justice, privacy, freedom of thought, expression and assembly, the right to asylum as well as the right to life, the films are both an emotionally powerful journey and an exercise in passionate filmmaking of the highest calibre. The directors: Kenny Glenaan, Douglas Gordon, Nick Higgins, Irvine Welsh, Mark Cousins, Tilda Swinton, Sana Bilgrami, Alice Nelson, Doug Aubrey, David Graham Scott, Anna Jones. Composer: Jim Sutherland. Both commercial and educational screenings are now available, please contact us for more details. There is currently a New Ten Commandments educational workshop project pilot underway with high schools around Edinburgh, please contact us below for more details.